Are you on deadline for a sleep-related information? We can help. We have hundreds and hundreds of articles on sleep-related issues, as well as bedding expert Dan Schecter. Dan can tell you all there is to know and more about pillows, toppers, mattress pads and mattresses. The bottom line is that we’re ready to help, so contact us. SleepBetter has commissioned numerous polls and conducted other research, most recently investigating the nasty things growing inside college student bedding. To view infographics from that study and get information about our other research, visit our Sleep Research page. SleepBetter has produced a number of educational and entertaining videos. You can view all of them on our sleep video page, or on the SleepBetter YouTube Channel. 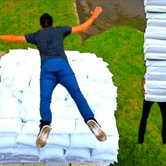 Don’t miss 2 Guys 600 Pillows, which won two Webby awards and has been viewed more than five million times! Dan is Senior Vice President of Consumer Products at Carpenter Co., and is also the creator of SleepBetter.org. Dan’s mission in life to to help people get the rest they so desperately need. With decades of experience in consumer products and more than 10 years with Carpenter Co., Dan is passionate about spreading the word about healthy sleep and sleep products. For non-media inquiries, including questions about SleepBetter products, please use our contact form. The above images are 300 dpi in JPG format. Carpenter Co. retains all existing copyrights on these images.